Fore more, visit our calendar. Left: Eagle by Bernard Langlais, ,ca. 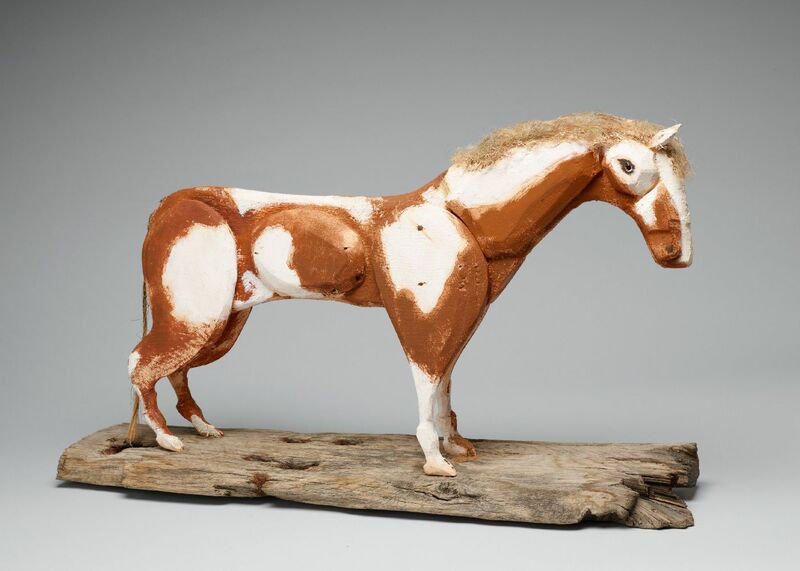 1964, raw and painted wood, 96 x 48 x 3 inches, Colby College Museum of Art, Gift of Mrs. Bernard Langlais. Photo: Pixel Acuity. On view at Colby College Museum of Art, Waterville, Maine. July 19 to January 4, 2015. Montgomery Montgomery Museum of Fine Arts: “Origins: The First Twenty-Five Years of the MMFA Collection”; July 12 to August 31. Bentonville Crystal Bridges Museum of American Art: “American Encounters: Anglo-American Portraiture in an Era of revolution”; to September 15. * # “Born of Fire: Ceramic Art in Regional Collections”; to March 2, 2015. Los Angeles Autry National Center: “Flo­ral Journey: Native North American Bead­work”; to April 26, 2015. * # “Route 66: The Road and the Romance”; to January 4, 2015. J. Paul Getty Center: “Chivalry in the Mid­dle Ages”; July 8 to November 30. # “In Focus: Ansel Adams”; to July 20. # “Rococo to Revolution: 18th-Century French Drawings from Los Angeles Collections”; to September 21. # “The Scandalous Art of James Ensor”; to September 7. San Francisco de Young Museum: “Shaping Abstraction”; to January 4, 2015. Legion of Honor: “Intimate Impressionism from the National Gallery of Art”; to August 3. * # “Matisse from SFMOMA”; to Sep­tember 7. * # “The Poetry of Parmigianino’s ‘Schiava Turca'”; July 26 to October 5. Santa Ana Bowers Museum: “The Lure of Chinatown: Painting California’s Chinese Communities”; to August 31. Stanford Cantor Arts Center, Stanford Uni­versity: “Inside Rodin’s Hands: Art, Technol­ogy, and Surgery”; to August 3. Edmonton Art Gallery of Alberta: “Lawren Harris and A. Y. Jackson: Jasper/Robson, 1924”; to August 17. Montreal Montreal Museum of Fine Arts: “Fabulous Fabergé: Jeweller to the Czars”; to October 5. Greenwich Greenwich Historical Society: “Enjoying the Country Life: Greenwich’s Great Estates”; to August 31. Yale University Art Gallery: “Byobu: The Grandeur of Japanese Screens”; to July 6. Old Lyme Florence Griswold Museum: “Art of the Everyman: American Folk Art from the Fenimore Art Museum”; to September 21.G “Thistles and Crowns: The Painted Chests of the Connecticut Shore”; to September 21. Waterbury Mattatuck Museum: “Fancy This: The Gilded Age of Fashion”; to October 19. Winterthur Winterthur Museum, Garden and Library: “Costumes of Downton Abbey”; to January 4, 2015. # “The Flowering of Amer­ican Tinware”; to January 4, 2015. Freer and Sackler Galleries: “An American in London: Whistler and the Thames”; to August 17. * # “Off the Beaten Path: Early Works by James McNeill Whistler”; to September 28. Hillwood Estate, Museum and Gardens: “Cartier: Marjorie Merriweather Post’s Daz­zling Gems”; to December 31. National Museum of Women in the Arts: “Meret Oppenheim: Tender Friendships”; to September 14. National Portrait Gallery: “Theodore Roosevelt and the East Africa Safari, 1909-10”; to August 3. Smithsonian American ArtMuseum: “Mod­ern American Realism: The Sara Roby Foun­dation Collection”; to August 17. # “Ralph Fasanella: Lest We Forget“; to August 3. Coral Gables Lowe Art Museum, Universi­ty of Miami: “Conquest and Coexistence: The Cultural Synthesis of Spanish Colonial Art”; to April 26, 2015. “Terrestrial Paradises: Imag­ery from the Voyages of Captain James Cook”; to July 13. Sarasota John and Mable Ringling Museum of Art: “Intent to Deceive: Fakes and Forgeries in the Art World”; to August 2. * # “In the Streets: Photographing Urban Spaces”; to July 13. Savannah Telfair Museums: “Helen Levitt: In the Street”; to September 21. # “Romantic Spirits: Nineteenth-Century Paintings from the Johnson Collection”; July 25 to Febru­ary 15, 2015. Honolulu Honolulu Museum of Art: “Art Deco Hawai’i”; to January 11, 2015. Field Museum: “Opening the Vaults: Wonders of the 1893 World’s Fair”; to September 7. Cedar Rapids Cedar Rapids Museum of Art: “Grant Wood: American Impressionist”; to September 21. Davenport Figge Art Museum: “Two Ameri­cans in Paris: Stuart Davis and Grant Wood”; to November 2. Des Moines Des Moines Art Center: “Ma­tisse: ‘Jazz'”; to September 21. Baltimore Walters ArtMuseum: “Seeing Mu­sic in Medieval Manuscripts”; to October 12. Boston Museum of Fine Arts, Boston: “D is for Design”; to February 22, 2015. # “Ja­mie Wyeth”; July 16 to December 28. * # “Over There! Posters from World War I”; Ju­ly 26 to June 15, 2015. # “Quilts and Col­or: The Pilgrim/Roy Collection”; to July 27. * # “Truth and Beauty: Pictorialist Photogra­phy”; to February 22, 2015. Deerfield Historic Deerfield: “Furniture Mas­terworks: Tradition and Innovation in Western Massachusetts”; to December 28. Grand Rapids Grand Rapids Art Museum: “Michigan Modern: Design That Shaped America”; to August 24. Minneapolis Minneapolis Institute of Arts: “The Coated Splendor: Art of Chinese Lac­quer (12th-19th centuries)”; to April 19, 2015. # “The Look of Love: Eye Miniatures from the Skier Collection”; to August 24. * # “Women in Craft and Design”; to July 20. Winona Minnesota Marine Art Museum: “Marine, Hudson River School, Impression­ist and Modern Art”; to December 31, 2015. Kansas City Nelson-Atkins Museum of Art: “Color and Line: Masterworks on Paper”; to August 24. # “Edgar Degas Pastels”; to Ju­ly 20. # “Gérôme and the Lure of the Ori­ent”; to July 20. St. Louis St. Louis ArtMuseum: “Flowers of the Four Seasons in Chinese and Japa­nese Art”; to September 1. # “Impression­ist France: Visions of Nation from Le Gray to Monet”; to July 6. * # “Louis IX: King, Saint, Namesake”; August 29 to November 2. Montclair Montclair ArtMuseum: “100 Works for 100 Years: A Centennial Celebra­tion”; to November 2. Point Pleasant Bay Head Historical Soci­ety: “Folk Art of Barnegat Bay”; to August 11. Garrison Boscobel House and Gardens: “The Hudson River Portfolio: A Beginning for the Hud­sonRiver School”; August 3 to November 30. Poughkeepsie Frances Lehman Loeb Art Center, Vassar College: “Faces and Figures in Self-Taught Art”; July 11 to August 31. Jordanville Foundation of Russian History, Holy Trinity Monastery: “The Russian Word and Im­age: Four Centuries of Books and Art”; ongoing. Utica Munson Williams Proctor Arts Institute: “A Century of Olmsted: Utica and Beyond”; August 14 to December 28. # “The Golden Age of European Painting”; to September 14. Frick Collection: “Enlightenment and Beauty: Sculptures by Houdon and Clodion”; to April 5, 2015. # “Men in Armor: El Greco and Pul­zone Face to Face”; August 5 to October 26. # “The Poetry of Parmigianino’s ‘Schiava Turca'”; to July 20. New York Botanical Garden: “Groundbreak­ers: Great American Gardens: The Women Who Designed Them”; to September 7. New-York Historical Society: “Homefront and Battlefield: Quilts and Context in the Civil War”; to August 24. # “Madeline in New York: The Art of Ludwig Bemelmans”; to October 13. Cover for Madeline’s Rescue, 1953Madeline’s Rescue (The Viking Press, 1953)GouacheIris & B. Gerald Cantor Center for Visual Arts at Stanford University, Laurel D. Schumann Collection, given in memory of her deceased father, Lawrence R. SchumannCopyright © The Estate of Ludwig Bemelmans. “The little girls all cried ‘Boo-hoo! '” 1956/57Madeline and the Bad Hat (The Viking Press, 1956/57)GouacheCollection of Mr. and Mrs. Charles M. RoyceCopyright © The Estate of Ludwig Bemelmans. Whitney Museum of American Art: “Collecting Calder”; July 17 to Octber 19. # “Edward Hop­per and Photography”; July 17 to October 19. Winston-Salem Museum of Early Southern Decorative Arts: “Art in Clay: Masterworks of North Carolina Earthenware”; to September 15. Cincinnati Cincinnati Art Museum: “Cincin­nati Silver: 1788-1940”; to September 7. * # “Conversations around American Gothic”; August 30 to November 16. # “Cries in the Night: German Expressionist Prints around World War I”; to August 17. Taft Museum of Art: “America’s Eden: Thomas Cole and The Voyage of Life”; to September 14. Cleveland Cleveland Museum of Art: “Dür­er’s Women: Images of Devotion and Desire”; to September 28. # “The Netherlandish Min­iature, 1260-1550”; to December 7. Toledo Toledo Museum of Art: “The Great War: Art on the Front Line”; July 25 to Oc­tober 19. # “In Fine Feather: Birds, Art and Science”; to July 6. * # “Fun and Games: The Pursuit of Leisure”; to September 21. Portland Portland Art Museum: “The Art of the Louvre’s Tuileries Garden”; to September 14. * # “Cobalt Blues”; to October 19. Chadds Ford Brandywine River Museum: “Exalted Nature: The Real and Fantastic World of Charles Burchfield”; August 23 to November 16. Philadelphia Pennsylvania Academy of the Fine Arts: “From Trompe l’Oeil to Modern­ism: Still Lifes from the PAFA Collection”; to August 23. Philadelphia Museum of Art: “Picasso Prints: Myths, Minotaurs, and Muses”; to August 3. Pittsburgh Carnegie Museum of Art: “Faked, Forgotten, Found: Five Renaissance Paint­ings Investigated”; to September 15. # “Sto­ryteller: The Photographs of Duane Michals”; to February 16, 2015. Bristol Blithewold Mansion, Gardens and Ar­boretum: “Sculpture Embraces Horticulture”; August 1 to October 13. Newport National Museum of American Il­lustration: “Norman Rockwell and his Con­temporaries”; to August 31. Newport Art Museum: “‘Very Simple Charm’: The Early Life and Work of Richard Morris Hunt in Newport, 1858-1878”; to September 14. Charleston Charleston Museum: “Unfurled: Flags from the Collections of the Charleston Museum”; to January 4, 2015. Nashville Frist Center for the Visual Arts: “Real/Surreal: Selections from the Whitney Museum of American Art”; to October 12. Austin Blanton Museum of Art: “In The Company of Cats and Dogs”; to September 22. Fort Worth Amon Carter Museum of Amer­ican Art: “Archibald Motley: Jazz Age Mod­ernist”; to September 7. * # “No Place Like Home: American Scene Painting in th Sinquefield Collection”; to October 19. Houston Museum of Fine Arts, Houston: “Al­exander Archipenko: The Berlin Drawings”; to August 17. # “Charles Marville: Photographer of Paris”; to September 14. * # “Houghton Hall: Portrait of an English Coun­try House”; to September 21. Charlottesville Fralin Museum of Art, Uni­versity of Virginia: “Reflections and Under­currents: Ernest David Roth and Printmaking in Venice, 1900-1940”; to August 10. Middleburg National Sporting Library and Museum: “Foxcroft School: The Art of Women and the Sporting Life”; to August 24. Richmond Virginia Museum of Fine Arts: “Catching Sight: The World of the British Sporting Print”; to July 13. * # “The Great War: Printmakers of World War I”; July 28 to November 9. # “Signs of Protest; Pho­tographs from the Civil Rights Era”; to Sep­tember 7. Williamsburg Abby Aldrich Rockefeller Folk Art Museum: “Inspiration and Ingenuity: American Stoneware”; through October. # “Tramp Art”; to October 4. DeWitt Wallace Decorative Arts Museum: “Changing Keys: Keyboard Instruments for America, 1700-1830”; ongoing. * # “China of the Most Fashionable Sort: Chinese Ex­port Porcelain in Colonial America”; ongoing. # “Painters and Paintings in the Early Amer­ican South”; to September 7. * # “A Rich and Varied Culture: The Material World of the Ear­ly South”; ongoing. Nordic Heritage Museum: “Danish Modern: Design for Living”; to August 31. An * indicates that a catalogue, brochure, and/or checklist is available for this exhibition. Informa­tion and photographs should be received three months before the opening month of an exhibi­tion and four months before lectures, sympo­siums, and antiques shows that include loan ex­hibitions or lectures.